Progressive circles in India have been late in remembering D. D. Kosambi in 2007, the centennial year. Of course Pune, where Kosambi lived and died, led the way to centenary celebrations. A committee was formed with R. P. Nene and Meera Kosambi, daughter of D. D. Kosambi, to pay homage to the savant extraordinary in a befitting manner. A number of public lectures were organized on and from 31 July 2007, with Romila Thapar, Irfan Habib, Prabhat Patnaik, and others as speakers. The Birth Centenary Committee has also been successful in persuading the Government of India to issue a postal stamp and instituting a Chair in the name of Kosambi in the University of Pune. The Human Resources Development ministry has sanctioned a grant of Rs. one crore (ten million) for this post. One, however, cannot be sure whether the right man will be appointed to continue the works of Kosambi along his lines. Memorial meetings have been held in Aurangabad, Kolkata, Goa, Manipal, and Mumbai and maybe in other places in India. A Kosambi Festival was held in Goa from 4 to 7 February 2008 to celebrate “the life and work of an extraordinarily erudite son of a legendary figure in Goan intellectual history, the Abhimanyu of an Arjun, as someone has said about Damodar Kosambi and his father Dharmanand” (Reported by Sandhya Palekar in Indian Skeptic, 21: 1, 15. 05. 2008, p. 18). Dr.Vivek Monteiro, a Harvard doctorate, who abandoned the Tata Institute of Fundamental Research to teach mathematics and science to the children of slum-dwellers of Mumbai, and finally became a trade unionist, gave a talk on “Science as the cognition of necessity”, the definition of science proposed by Kosambi. Such attempts, however laudable, are not sufficient to make the new generation aware of what a versatile genius Kosambi was. Of course, it is not possible for a single person even to describe in broad terms, not to speak of evaluate, the contributions made by Kosambi in such diverse fields as anthropology, archaeology, classical genetics, Indian history, mathematics, numismatics, statistics, and Sanskrit text criticism. He was equally thoroughgoing in all the disciplines he had enriched. The bibliography of his works is bound to fill anyone with awe. A man like him is rare in all ages, more particularly in our times when ‘superspecialization’ is the key to both fame and success. In what follows I shall try to give an inkling of the man Kosambi, not the prodigious scholar he was. “As an independent thinker with a passionate devotion to scientific research, he seemed to be almost exclusively preoccupied with his own intellectual pursuits. As such, he was sometimes accused of brusqueness and intolerance, but he had obviously no use, nor time for all the sophistications of our normal social life, nor could he afford to waste his energies on empty rituals and ceremonies, except for treating them as objects of his anthropological studies” (Annals of the Bhandarkar Oriental Research Institute, vol. 47 (1967), reprinted in: R. S. Sharma (ed. ), Indian Society: Historical Probings, New Delhi: People’s Publishing House, 1974, p. 4). Not that Kosambi himself was unaware of his acid tongue. He has himself recollected how, in his early boyhood, his grandmother would seat him upon her lap and put sugar into his mouth with a benediction that his words might be sweet. Kosambi wryly commented: “Those who witnessed this charming, ridiculous, now forgotten observance feel, judging from the result, that she did not use enough sugar!” (An Introduction to the Study of Indian History, revised second edition, Bombay: Popular Prakashan, 1975, p. 381 n). A grave and sombre person, he could, on rare occasions, relax, and then, as Gokhale assures us, “his childlike simplicity and sparkling wit were most refreshing even to those who were nearest to him and he spread laughter and sunshine around him.” But this is only one façade of his personality. He was also capable of playing pranks, just to irritate people who did not share his views. Think of his dedication of the Three Centuries of Bhartrihari’s Sanskrit Epigrams published in the Singhi Jain Series in 1948. In chaste Sanskrit he dedicated the work (which may be translated as follows): “In sacred memory of the pioneers of new human society, the vigorous great men (mahamanava) named Marx, Engels and Lenin.” Similarly he dedicated the collection of epigrams, Vidyakara’s Subhashita- ratnakosha (1957) edited jointly by him and V. V. Gokhale, “to all those who work for peace by peaceful means”. The work was published in the Harvard Oriental Series with Professor Daniel H. H. Ingalls as the Series editor, who was an anticommunist to the core. Kosambi was active in the World Peace Council, suspected by the U. S. establishment as a front organization of the international communist movement. The highly skilful editing of the joint editors was appreciated by all (well, almost all) but Louis Renou, the doyen of French Indologists, was taken aback by the Introduction written by Kosambi. Renou could not understand why a scholarly work, a critical edition of an anthology, should contain such items as class struggle (Jounal Asiatique,vol. 245, fascicule 4, 1957, p. 406). To take another example: Kosambi dedicated the second dition of his Introduction to the Study of Indian History (1975) “to Indo-Soviet Friendship” (the first edition (1956) was dedicated to Monica Felton, a Stalin Prize winner) in place of an individual. It is not enough to explain Kosambi’s pranks as something to be expected of a true Marxist disdaining to conceal his views. More likely he had a puck in him who encouraged him to do and say things that would irritate other people. In his meetings with Homi Bhabha in TIFR, he used to oppose whatever Bhabha proposed. Bhabha could not tolerate contradiction and Kosambi revelled in it. This did not contribute to the furtherance of his career but he could not help being what he was: a maverick. Kosambi has often been accused of his disrespectful attitude to and open sniggering at eminent scholars, who were his contemporaries. It cannot be denied that he was a man of strong likes and dislikes. To take one example, look at his dismissal of an erudite German Indologist: “W. Ruben’s Einführung in a. Indienkunde shows how a good Sanskritist can go to pieces because of Marxism ill disgested…” (Introduction, etc., p. 14 n1). O. Herold is curtly written off for assuming the Urvasi-Pururavas legend as a case of Aryan group-marriage, “for which there might be no evidence but which apparently makes no difference to his judgment, being required by some (presumably Marxist) theory” (Myth and Reality, Bombay: Popular Prakashan, 1962, p. 54 n6). Anyone unacquainted with Kosambi’s world view would take him to be an anti-Marxist if such comments are read out of context. Or one might think that Kosambi considered himself to be the sole depository of Marxism, every other Marxist unfit to be called so. Yet the fact remains that Kosambi was always prepared to honour those to whom it was due. Naturally his standards were very high, and so the only names he mentions are bound to be of persons of the first water. At the end of his Introduction to Myth and Reality he writes: “Readers will recognize my debt to B. Malinowski, H. Obermaier, H. Breuil and H. Frankfort, among other giants; but more than any other, to K. Marx” (p. 11 n). Strangely enough, F. Engels is not mentioned here, although in a letter to Vidal-Naquet (dt. 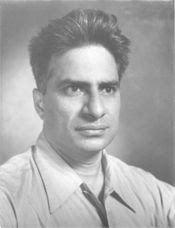 4 June 1964) Kosambi said: “I learned from these two great men [Marx and Engels] what questions to ask and then went to fieldwork to find the answers because the material did not exist in published books.” In course of a conversation with Charles Malamound, Romila Thapar came to learn that Kosambi had admitted to him that the deepest intellectual influence on him had come from the works of Engels (R. Thapar, “The Contribution of D. D. Kosambi to Indology”, Journal of the Asiatic Society of Bombay, New Series, vols. 52-53/ 1977-78, pp. 381 and 384 n55). Kosambi’s admiration for Stalin, more particularly for his polemics against Academician Marr, is apparent from a reference to the rejoinders written by Stalin and printed in the journal, Soviet Literature (Myth and Reality, p. 44 n1). Kosambi’s respect for truly eminent persons was not confined to Marxists. In a sharply phrased passage he makes fun of worthless Sanskritists and upholds a Christian Missionary: “The ability to replace incomprehensible Sanskrit works by still larger and equally meaningless English terms can make a prosperous career. It cannot produce an Albert Schweitzer, whose magnificent study Von Reimarus Zu Wrede, analysis of Bach’s music and record as medical missionary at Lambarene were impressive even in my irreverent undergraduate years” (“Adventures into the Unknown” in K. Satchidananda Murty and K. Ramakrishna Rao (ed. ), Current Trends in Indian Philosophy, Waltair: Andhra University Press/ Bombay: Asia Publishing House,  , p. 154). There is no denying that Kosambi was a proud man, impatient with lesser mortals and aggressive in attitude. But by no means was he too proud to accept his own errors. When J. Brough corrected one of his mistakes, he admitted it in unequivocal terms (see Introduction etc., p. 109 n12). Every competent judge who saw only this radically new basic result intuitively felt that it was correct as well as of fundamental importance. Unfortunately, the Reimann hypothesis followed as a simple consequence. Could a problem over which the world’s greatest mathematicians had come to grief for over a century be thus casually solved in the jungles of India? Psychologically, it seemed much more probable that the interloper was just another ‘‘circle-squarer.’’ Mathematics may be a cold, impersonal science of pure thought; the mathematician can be thoughtless, heatedly acrid, even rabid, over what he dislikes. Let me admit at once that I made every sort of mistake in the first presentation. There is no excuse for this, though there were strong reasons: I had to fight for my results over three long years between waves of agony from chronic arthritis, against massive daily doses of aspirin, splitting headaches, fever, lack of assistance and steady disparagement. It was much more difficult to discover good mathematicians who were able to see the main point of the proof than it had been to make the original mathematical discovery. How much of this is due to my own disagreeable personality and what part to the spirit of a tight medieval guild that rules mathematical circles in countries with an ‘‘affluent society’’ need not be considered here. There is surely a great deal to be said for the notion that the success is fundamentally related to the particular form of society. (Current Trends in Indian Philosophy, p. 168. A part of this posthumously published essay has been reprinted in other volumes by and on Kosambi bearing a new title, “Steps in Science,” without, however, this significant Epilogue). How should one judge the matter? Are we to take this as the raving of a paranoid or are we expected to sympathize with a man silently rejected for being a non-Westerner? Much depends on one’s attitude. I for myself believe that Kosambi was right; he has been shabbily treated both in India and abroad. Even now he remains neglected and misunderstood. Death released him from all ignominy in the early hours of 29 June 1966. I am not competent to speak of Kosambi’s achievements in scientific fields. As a student of Indology, I believe that his books and articles remain a quarry of the most fruitful ideas to be developed by his successors. This is not to say that Kosambi was always right. Some of his cherished theories and hypotheses have been challenged and, in a few cases, disproved. But that does not detract an iota from the merit of his works or his achievements as a historian. As D. Lorenzen observed, when some otherwise sound historians like A. L. Basham purposely hesitated to offer radically new and speculative interpretations of the sources of change and conflict in ancient India and of the interrelations of economy, politics, social structure, and cultural values, “ D. D. Kosambi has no such hesitations. His two general works, An Introduction to the Study of Indian History and The Culture and Civilization of Ancient India in Historical Outline, spew forth new ideas and provocative comments as if from a shotgun . Although some of his speculative hypotheses are virtually impossible to verify, many have opened up fruitful new paths of understandings and research” (“Imperialism and the historiography of ancient India” in: S. N. Mukherjee (ed. ), India: History and Thought, Calcutta: Subarnarekha, 1982, p. 98). This boldness is what is lacking in the works of many later historians. They are afraid to go in for systematic theoretical generalizations. A historical work which makes such generalizations undoubtedly risks, indeed requires, the formulation of an ideological bias, but this is, after all, what makes it food for thought. No one today reads Grant or Mill, or even Nehru, because of their historical accuracy. They remain important works precisely because of the ideological biases of their authors. ‘‘Accuracy,’’ as Housman once remarked, “is a duty, not a virtue.’’ (p. 100).